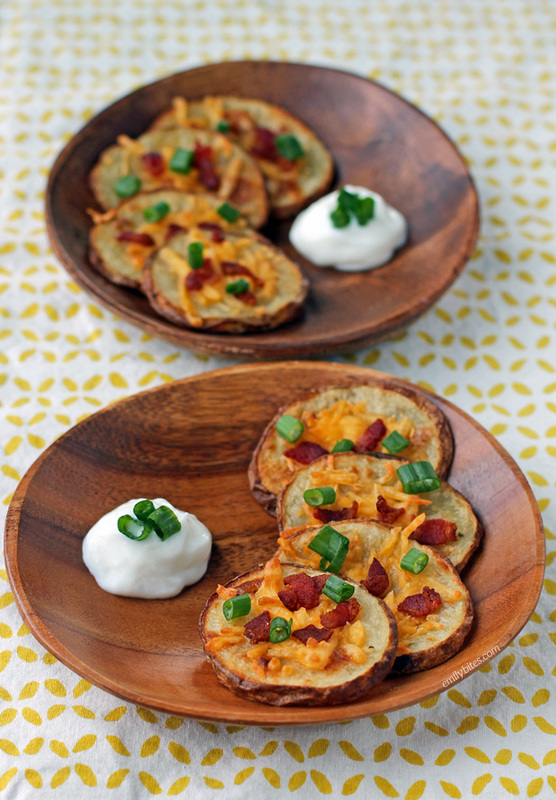 If you love potatoes, cheese and bacon, you’re going to love these Loaded Potato Rounds. If you don’t love those things…<does not compute>. I’m just going to go ahead and assume we all love these things because I can’t wrap my head around that not being the case (even though my husband doesn’t like bacon – he’s clearly an alien). 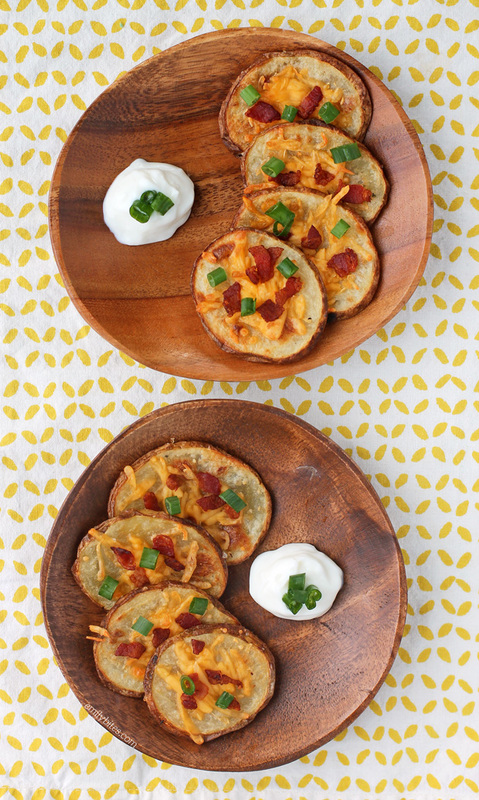 These Loaded Potato Rounds are perfect finger food for a party or football game, but I think they’d also be great as a side dish! I was toying with the idea of making potato skins, but I hate the idea of scooping out a bunch of the potato and not using it. Plus, you have to bake them before you roast them and that seemed like a lot of work for an appetizer. I thought it would be easier to just slice the potatoes into rounds like I did for my Sweet Potato Casserole Stacks and roast them right off the bat. So here you have it, roasted potato rounds with melted cheese and bacon! I served these with a little bit of sour cream for dipping, but they’re great on their own as well. Serve these up on game day next weekend and watch them disappear! Place the diced bacon into a small skillet and bring to medium heat. Once the bacon begins to sizzle, cook stirring occasionally until the bacon pieces are crisp. Remove the bacon pieces to a paper towel stack using a slotted spoon and set aside. 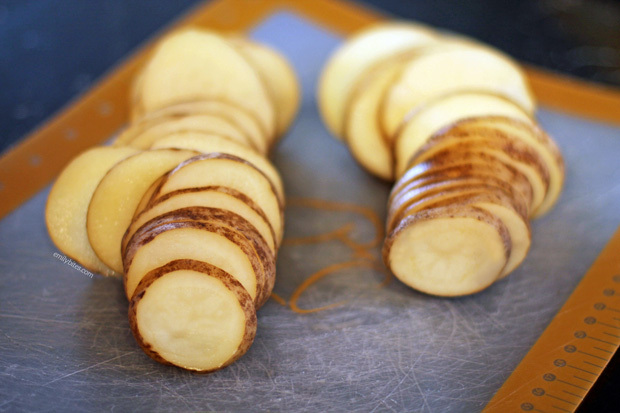 Slice the potatoes into 1/4” thick rounds. Place the rounds into a large mixing bowl and drizzle with the olive oil. Stir together until the potatoes are fully coated. Lay the potato rounds in a single layer on baking sheets and sprinkle with sea salt. Bake in the oven for 35-40 minutes until potatoes begin to get golden. Remove the potatoes from the oven and sprinkle with the shredded cheese and cooked bacon pieces. Move the oven rack to the top and set the oven to broil. Place the potatoes back in on the top rack and broil for 1-2 minutes until cheese is melted. Remove from oven and sprinkle with sliced scallions before serving. *How many potato rounds this makes depends on how many you cut, so I recommend either counting or weighing your finished potatoes and dividing that by 6 to determine serving size! I love potatoes so much that they are so easy to overeat. I like this idea of little bites of potato appetizers! I hear ya! I hope you try them and love them! Hello, I’m new to Weight Watchers and I’m having a hard time finding the recipe builder in the WW app or on their website. Could someone point me in the right direction? If you’re logged in on the WW website, click on the “My Foods” heading, then click “recipe” and then “Create a Recipe.” It should definitely be placed more obviously! I actually bookmarked the recipe builder in my browser so I can just head right to it, so if you end up using it frequently you may want to do that. I hope that helps! Emily, these look so good! I love home made potato skins, but they are a lot of work and there is a lot of waste, although you can always save the scooped potato for mashed or potato soup too. But this is a neat idea and less work. I can see these getting gobbled right up! I’ll be making these for the football game next week for sure. Just made these tonight to go with your ranch tenders and some hot Buffalo tenders in honor of the Superbowl. These were DECADENT!! SO good! Thank you for this recipe! I have had something exactly like this, but they used sweet potatoes….do you think your recipe would work using a sweet potato instead? Thanks! Made these tonight and they were delicious…and oh, so easy!! Will be making these again. And again! Thank you for sharing all of your amazing recipes! These are really great! I loved them. Quick question…want to make for Suoerbosl and toying with baking slices ahead and then reheating, topping and broiling to melt the cheese. Do you think that would work?